Background: During HIV infection, fusion of the viral and cellular membranes is dependent on folding of the gp41 trimer into a six-helix bundle. Fusion inhibitors, such as the antiretroviral Enfuvirtide (T20), interfere with the formation of the gp41 six-helix bundle. Recent in vitro studies reveal that the gp41 immunodominant region one targeting antibody 3D6 can block T20 interference, but the clinical and pathophysiologic significance of this finding is unclear. 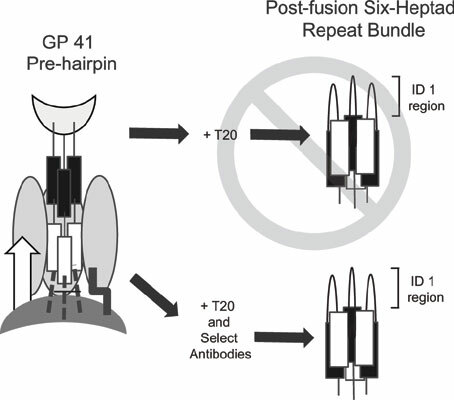 Objective/Method: We have previously characterized a number of antibodies that target conformational epitopes on gp41and herein characterized their ability to interfere with T20 in multiple assays and assess their prevalence in HIV infected subjects. Results: The T20 interference by antibody 3D6 was confirmed in a CHO-HXB2 envelope/ HeLaT4+ cell culture assay. Antibodies that target an immunodominant region one epitope, as well as a gp41 discontinuous epitope, also interfered in this assay, however, not all antibodies that targeted these epitopes showed T20 interference. This response was not due to the direct binding of T20 by the antibodies and could not be replicated utilizing TZM-bl and HL2/3 cells. Notably, serum competition studies on a panel of HIV subjects demonstrate that these conformational targeting antibodies are common in the HIV population. Conclusion: The relatively common nature of antibodies targeting these epitopes, the disparate in vitro results, and lack of reported clinical failures ascribed to such antibodies leads us to conclude that antibody interference of T20 is likely not clinically relevant. However, this warrants continued consideration with the advancement of other fusion inhibitors. HIV, T20, enfuvirtide, antibody, gp41, fusion.